Renewed interest in the Artisan Bread Business is proof that, despite the low-carb craze that recently swept the nation, “bread is not dead.” Many claimed the death knell had rung for the bread industry. One study showed bread and roll sales had declined 3.1% in 2000. Another revealed 40% of Americans were limiting their carbohydrate intake in an effort to eat healthier. But by 2005, the landscape had changed: the iconic, low-carb Atkins brand entered bankruptcy protection; bread consumption was in the midst of a two-year rebound and market forecasters predicted double-digit growth sales in the near future. The underlying cause behind this renaissance was simple: Americans love their bread, and interest in artisan bread recipes is fueling growth in the artisan bread business. 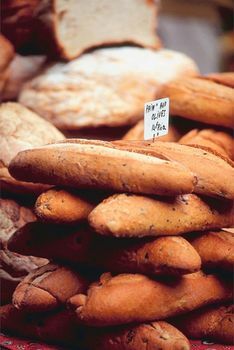 In 2004, the commercial bread industry brought in $23.8 billion dollars despite an overall decline in the volume of bread shipped.2 Revenue growth in the U.S. bread industry (18% between 1998 and 2003) has been primarily attributed to shifting consumer tastes away from traditional sliced varieties and toward more expensive artisan breads. Even with the slight decline in consumption, bread products remain the second most popular grocery item – behind carbonated drinks. What Does the Artisan Bread Business Include? Although some baking purists retain an exacting definition of what constitutes “artisan” bread, most artisan bread business experts acknowledge it as an ambiguous label used to describe nearly all non-sandwich breads on the market today. The definition includes everything from Old World crusty loaves to ethnic varieties from exotic locales across the globe. Furthermore, there is agreement that “artisan” describes breads that are typically freshly made (most often in on-site ovens) and sold within two days of being baked. Quickly becoming more and more available in supermarkets, artisan breads represent the best growth opportunity for bakeries of all sizes. By 2003, sales of premium breads totaled $933 million, or 16% of all bread sales, and were continuing to climb.2 In fact, when the North Carolina-based supermarket chain Harris Teeter decided it would no longer stock artisan breads, the announcement was met with an impassioned customer backlash ultimately leading the chain to reconsider its plan.10 More than ever before, consumer choice is driven by a new era of culinary sophistication. A 2004 study by the Shapiro Research Group suggests that 40% of Americans have reduced their bread consumption from the previous year.6 This movement hurt the bottom line of industry leaders Interstate Bakeries (who filed for bankruptcy protection in late 2004) and Sara Lee Inc., both of whom are more heavily involved in the sandwich bread segment. Small bakeries specializing in artisan breads with European pedigrees fared much better, benefiting from an 18% growth in specialty bread sales between 2001 and 2003. As the low-carb diet craze fades further and consumers resume buying breads, their tastes are being influenced by a new focus on nutrition. Increasingly, consumers are purchasing the whole-grain and specialty offerings in lieu of white bread.2 Bakeries are content with this substitution as profit margins are greater on artisan breads compared to sandwich breads (where private labels dominate the market). It is rare that a foodstuff can achieve the sustained market penetration of bread. Having long been a staple of mankind’s diet, baked grains are consumed by nearly every society around the world. 2“Bread, Cake, and Related Products.” Encyclopedia of American Industries. Online Edition. Thomson Gale, 2006. “United States Bread and Rolls” Datamonitor Industry Market Research. 2001. Gale Research, 2001. This material is based upon work supported by the U.S. Small Business Administration. Any opinions, findings, conclusions or recommendations are those of SBDCNet and do not necessarily reflect the views of the U.S. SBA. The SBA funds this U.S. Small Business Administration (SBA) Grant. SBA’s funding is not an endorsement of any products, opinions, or services. All SBA funded programs are extended to the public on a non-discriminatory basis.